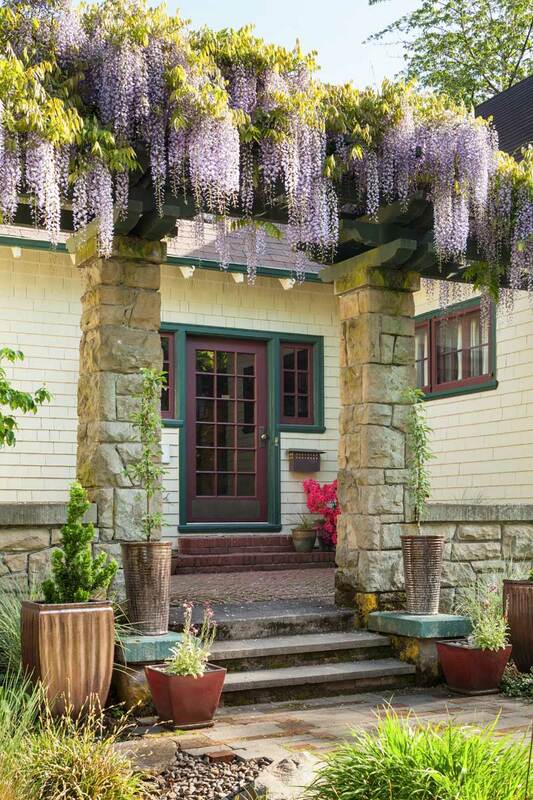 A romantic pergola of basalt (stone) and wood spans the front of the 1910 house, which was modeled on a 1907 house plan in The Craftsman. Photos by William Wright. 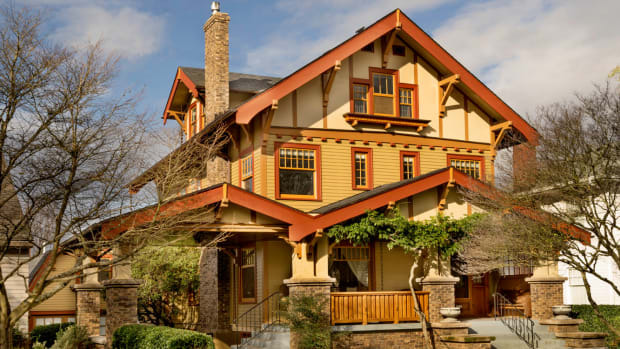 The Gilliland House in Portland, Oregon, was built according to plans published in Gustav Stickley’s magazine in 1907. It’s been restored by owners who took cues from the original article. 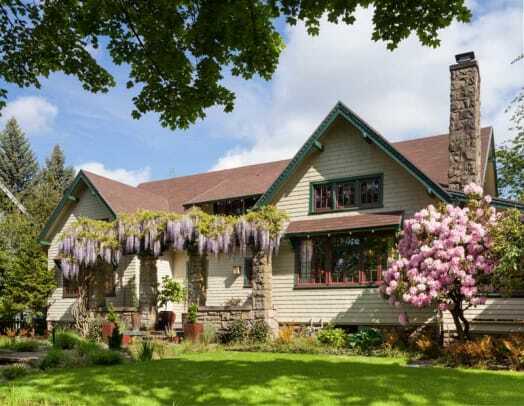 Described in the April 1907 issue of The Craftsman magazine as “A Bungalow of Irregular Form and Unusually Interesting Construction,” the plan for this house was refreshingly open. 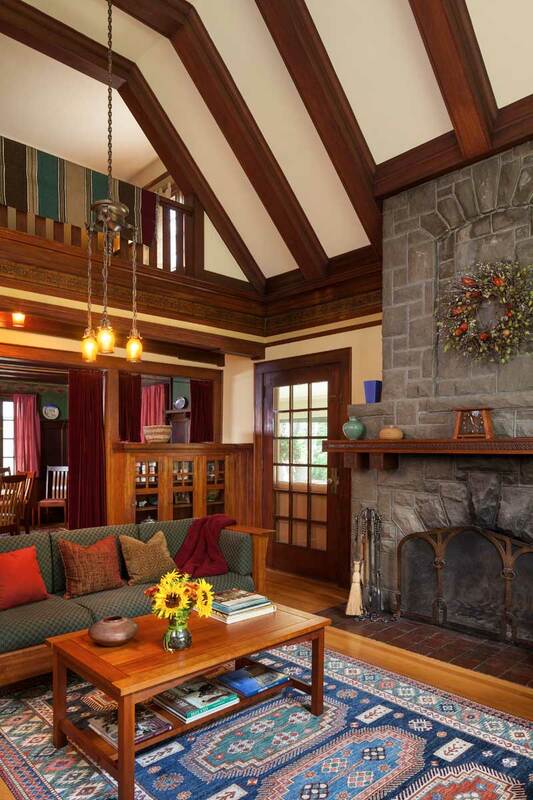 Downstairs, spacious public rooms centered on a soaring great room anchored by a massive stone fireplace. 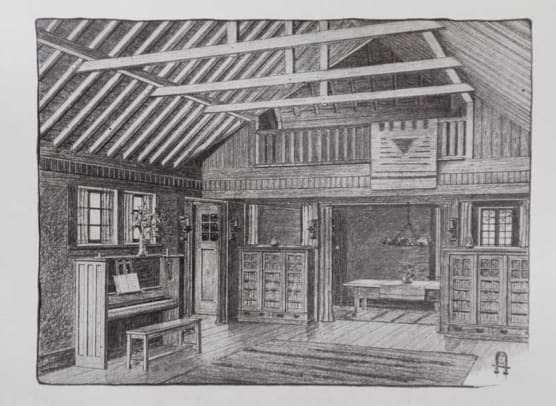 (Stickley or his designers had adapted sketches sent to them by George D. Rand of Auburndale, Mass., a retired architect working on a summer house he would build in New Hampshire.) 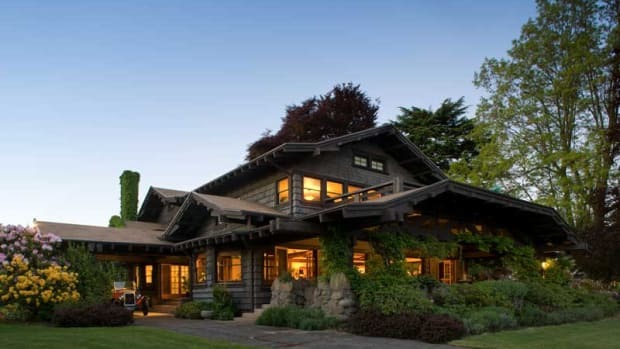 In 1910, prosperous Portland businessman Lewis T. Gilliland commissioned the well-known architect Ellis Lawrence to build a fashion- able bungalow from the magazine’s plans. Construction cost over $15,000, a sizable sum in 1910. Ninety years later, the house was still recognizable, but had fallen into disrepair during its years as a nursing home and then headquarters for Indian cult leader Bhagwan Shree Rajneesh. The house boasts a two-storey great room centered on a basalt fireplace and crowned with a beamed ceiling. An open library in a balcony overlooks the room, which is lit by its original chandeliers. Scott and Daria Colner saw the property in 1998, and almost didn’t bother to go inside. The front porch and style-defining pergola were invisible behind a tangle of vines and unpruned shrubbery. Inside, much of the original woodwork and trim was painted out in antiseptic white; the musty odor of mildew rose from a water heater leak in the basement. White shag carpeting covered handsome floors of oak and fir. Windows were inoperable: cords, counterweights, and hardware had been removed, and the sashes were painted shut. The kitchen had been awkwardly remodeled with an island so large, the refrigerator and cabinet drawers could not be opened fully. Every system needed updating, and the roof, covered in failing asbestos-containing faux slate tiles, needed replacement. The pergola had settled and was in danger of collapsing. Somehow, the couple could envision the original intention behind Stickley’s published plan. They saw that open rooms flowed into one another; though the house is rather large, it is informal and unpretentious. 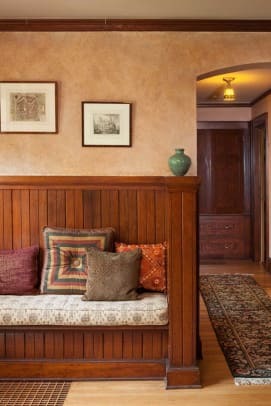 Honduran mahogany box beams on the ceilings, wainscoting and substantial mouldings, built-in benches and bookcases create a warm, intimate interior. Next to the kitchen, an open family room—a bedroom in the original plans—had a fireplace, and the full basement would serve as a playroom for the Colner children. Scott and Daria took the plunge. They began with the basics: replacing the electrical, plumbing, and heating systems and adding a new composition-shingle roof. 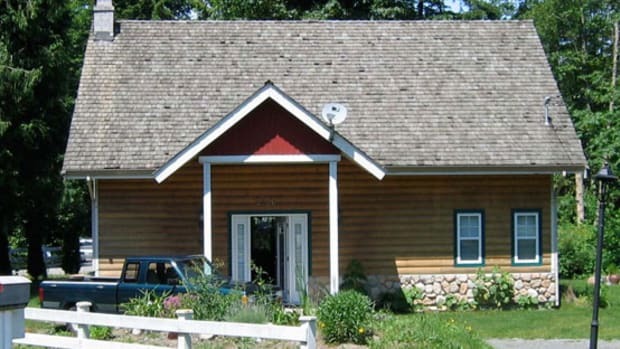 The exterior of the house was painted in period-appropriate ‘Wild Rice’ from Miller Paints, with ‘Roycroft Bottle Green’ and ‘Arresting Auburn’ trim and accents. 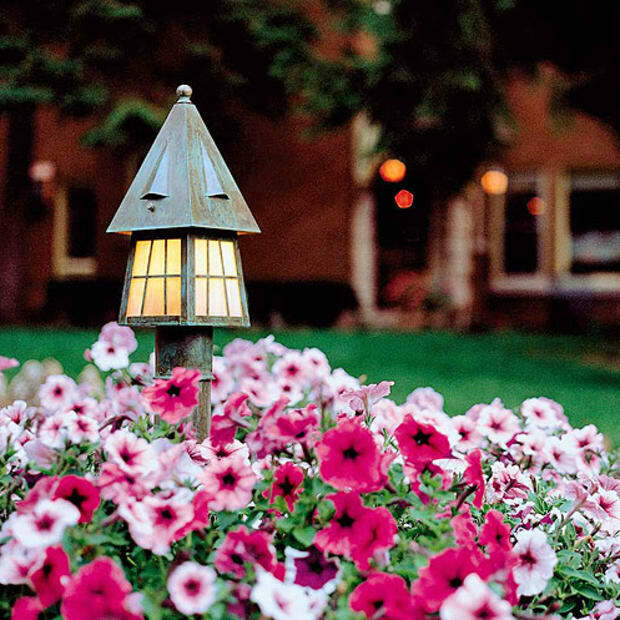 Curb appeal was restored with the stabilization of the romantic pergola–porch in front. In a process that took several years, nearly all of the house’s 43 windows were stripped, re- paired, and rehung. Original interior screens are undergoing restoration now. Next came high-priority rooms. 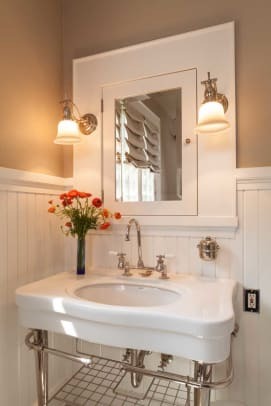 Bathrooms were restored with period-style fixtures, and with wainscoting and trim milled to match woodwork in the rest of the house. The kitchen space was taken down to the studs. Its maple floor wasn’t salvage- able and so the Colners replaced it with new maple flooring. 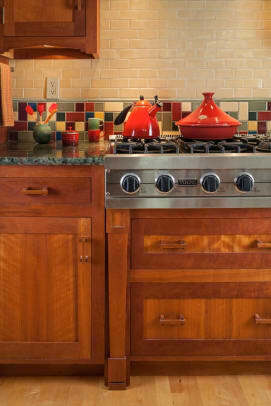 Custom cherry cabinets have an Arts & Crafts style with a “lift” along their bottom edges that is similar to woodwork details in the dining room. 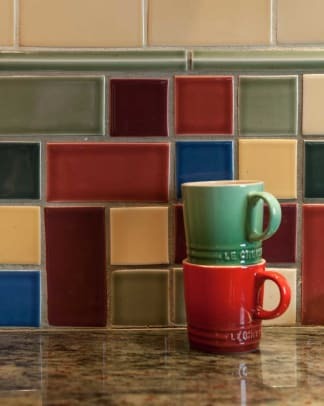 Inspired by hand-painted pottery they’d collected in Europe, Daria designed the colorful tile backsplash, which is balanced by dark granite countertops. The open library that overlooks the great room was re- stored, its white-painted fir woodwork patiently stripped. 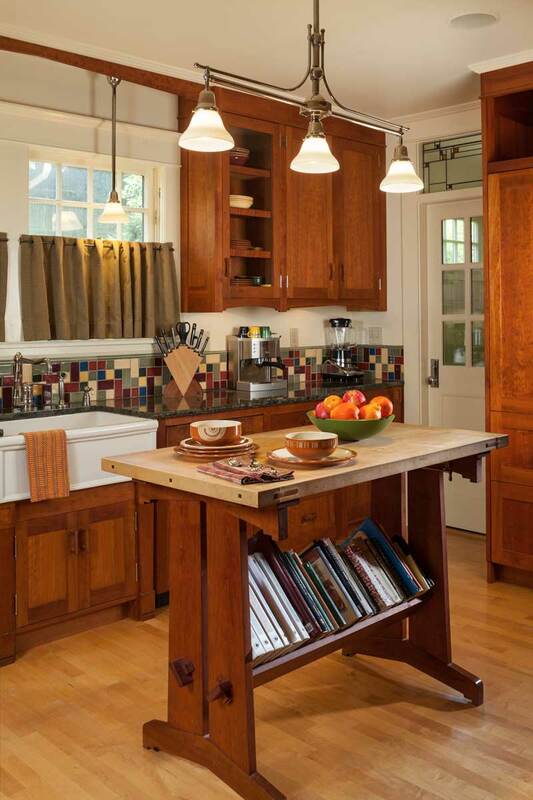 Craftsman-style furniture fills the space. Over the railing, the couple hung an Indian blanket they bought in a small village near Santa Fe—replicating what they saw in the 1907 illustration. 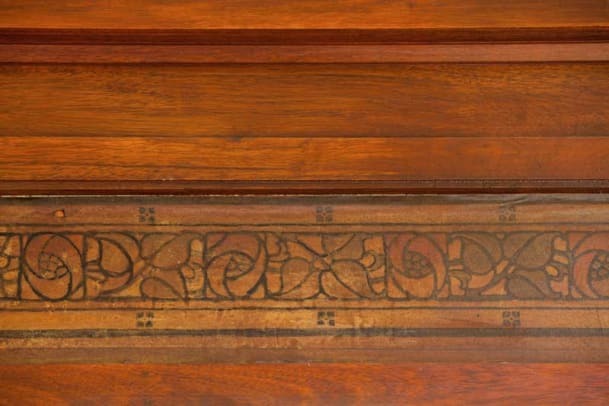 The mahogany mantelshelf on the stone fireplace has an unusual carved detail. The pottery is by contemporary Pacific Northwest artist Ann Selberg. Happily, woodwork in the great room had never been painted; it just needed a thorough cleaning. Guided by period illustrations, the couple chose such furnishings as a 1912 player piano, a comfortable cherry settle, and a Morris chair and ottoman that have been re-issued by today’s Stickley. 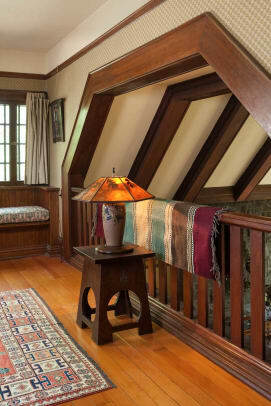 The dining room, too, had its original, unpainted mahogany wainscoting and box-beam ceiling. The Colners chose Brad- bury & Bradbury Wallpaper’s ‘Glenwood’ wall fill and ‘Arcadia Border’ (a pendant frieze) for the walls, the rich Forest colorway complemented by a stained-glass chandelier from Rejuvenation that hangs over the custom-made round dining table. It’s easy to imagine that Gustav Stickley would warmly approve of the house today: After restoration, it is welcoming inside and out, spacious but not too grand. 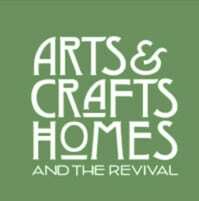 Arts & Crafts-inspired cabinets have wooden pulls. 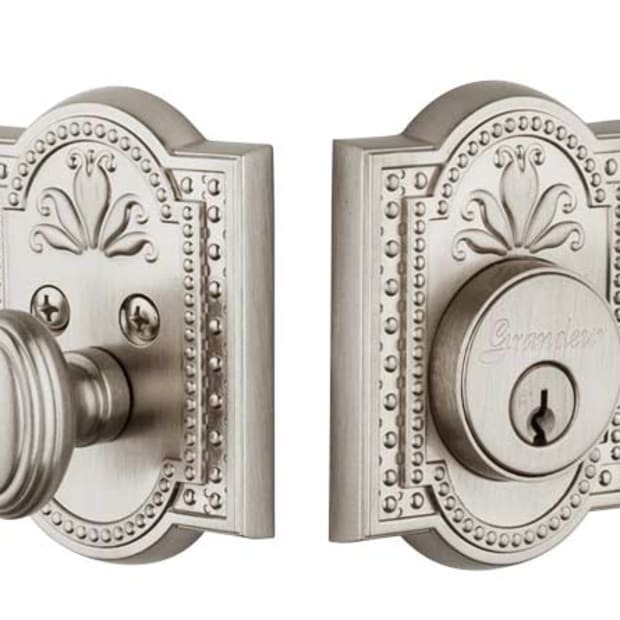 The hardware lends period style. 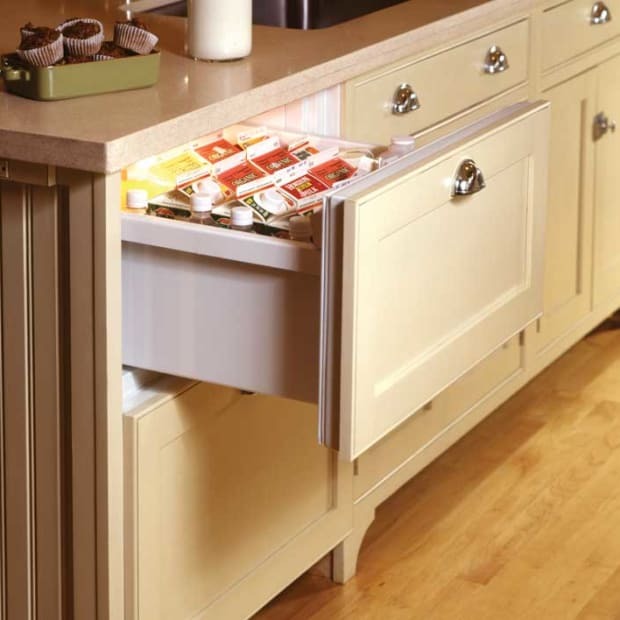 Here the choice was custom pulls in cherry, even for the refrigerator front. Cabinet construction and details should be based on period models. Put “feet” on the cabinets to emulate the look of cased furniture. 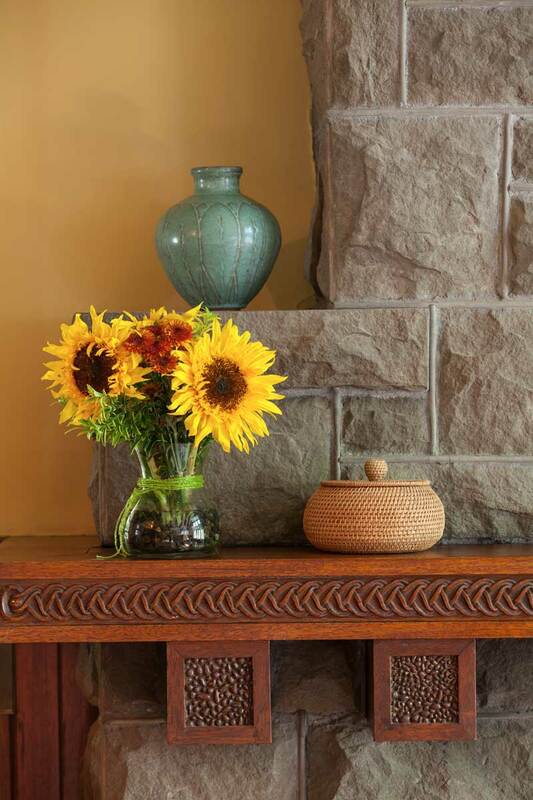 Trim and cabinets may be naturally finished wood or painted white, but it’s okay to add color. The tile backsplash is colorful yet well blended into the design. Use subtle repetition. Here the alternating lighter and darker maple floorboards are echoed in the two-tone cabinets. Linear light fixtures pick up on the design of the transoms. A center island can look historical: keep it small or design it like a piece of furniture. These owners did both.